Discussion in 'Members Personal Layouts' started by Bear, Dec 4, 2016. Just watched your video before heading out the door to work. Didn't realise it was so long .....,,, couldn't put it down ...... Late now. Great collection and a fantastic layout to stretch their legs on. Thanks for sharing that with us. PS ....... Your mug ain't that bad. That`s a nice comfortable railway room you have there and a great selection of trains. It`s nice to see something different for a change. Wow Bear what a great collection of locos and trains you have. I remember that Orange TGV from the Lima catalogue when I was growing up. I bought the XPT in NSW rail livery for $100 but always dreamt of one day getting that TGV. it will be great to see it running on that massive layout you have there. Bear a great video and a very nice collection of models thanks for sharing. Thanks guys. A general idea is to have each side a different "theme". Sort of industrial (with all the points), farmland on the lift bridge because I can't put buildings there (would hit against the wall when lifted), suburban platforms and town (I might be sneaky and put a mirror at the end of the street so it appears twice as long) , and I don't know for the southern side. 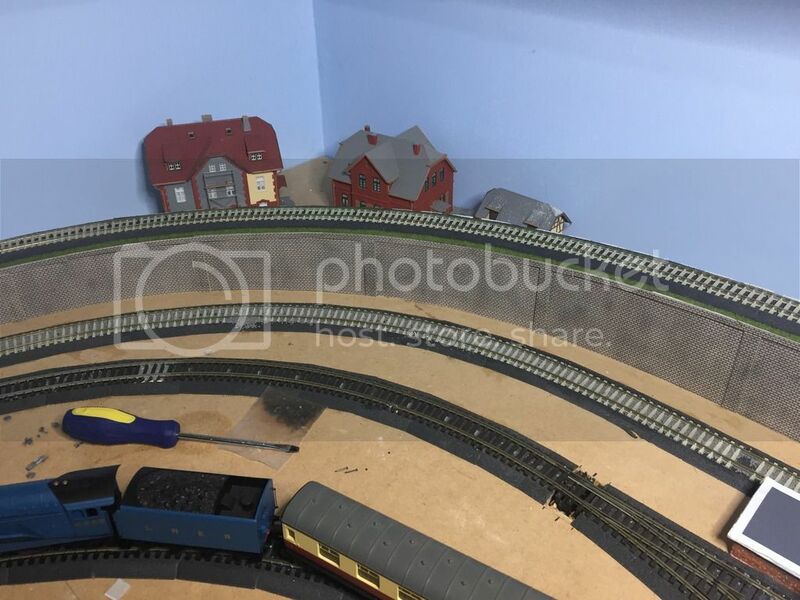 I once had plenty of room for scenery but got carried away and filled the boards with track now so maybe some sort of mountain backdrop behind the incline leading to a snow capped mountain in the corner? Who knows. One thing I made sure of is, that I was wanted to be able to change designs to overcome any problems encountered. Didn't want to do a lot of work then find it wouldn't work and rip it up again. I have looked at a lot of layouts on Youtube and the different approaches taken. 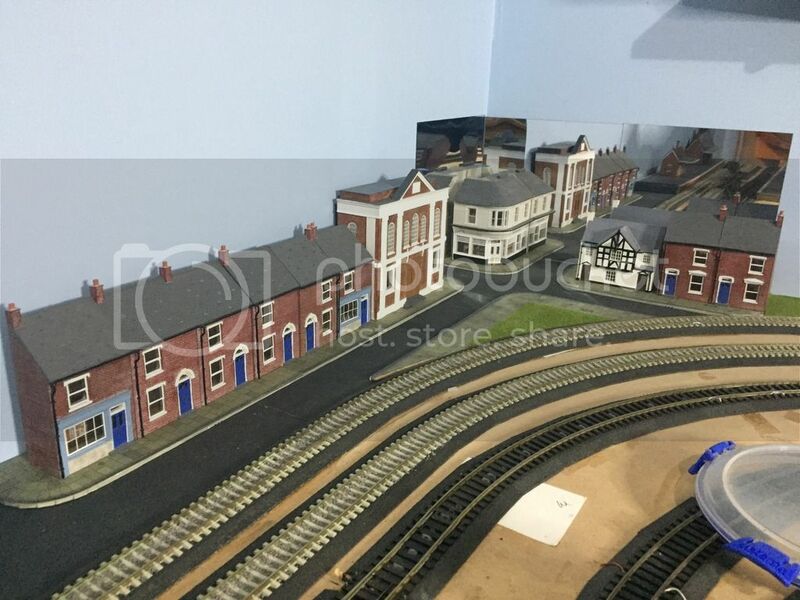 Everard Junction has just one area of intense scenery and the rest of the layout is hidden. Other guys just lay track on boards, put a few houses etc down but no grass or trees because they just like to run the trains. Some people have more streets than track but to me that seemed to miss the point of a train layout. The ultimate aim is for the layout to be a backdrop for videos I guess and I wanted to use chromakey a bit. I did a small test with it and was surprised how easy it was. I can run 5 trains, each on it's own loop but I am hitting a bit of a wall in regards to power supply. The Rocos draw a lot of current and I was running 6 today and tripped the thermal overload on the elink which has a 4A supply. When my Ecos arrives, I will be able to monitor the current closely and mix and match trains so I can run 8 or 9. The Hornbys draw a lot less current than the euro stuff. Great to see trains not just from different eras, but different continents as well. Must admit I've been tempted by some European and US locos from time to time. G'day Bear, good video and a great collection of models. The video really shows up the differenece in scale/size of your HO and OO collection. Will be going back to have a gander at your other videos. Keep up the good work and videos. When looking at trains, I follow one simple philosophy.If I find myself thinking "hmm, that looks nice/weird/interesting", I check it out as much as possible and buy it. Got to agree, it looks the part but ouch $1000, that hurts. Yep that`s outa my league too Toto........but nice....Ooooh yeah!! Gday folks. Latest vid for the layout. I'll get a look at your video when I get home tonight. That`s a nice piece of gear you`ve got there Bear. Santa has indeed been kind to you!!! Finally had a go at some scenery. Still a long way to go but I think it shows promise as it was my first attempt. The street is 1200 wet & dry paper, the houses etc sit on 3mm MDF so I had a gutter. Still have to put some road markings down (going to use car pin striping) and add some people, cars and lights. The mirrors are a bit of an experiment and may not stay if i can find a suitable "street scene" photo for a back drop.The retaining wall for the incline is Metcalfe cobblestone printed card. Needs a bit more work but looks ok I reckon. The mirror works a treat. It would be a keeper for me. Your retaining wall is also the biz.